It's that time of year where everyone is gearing up for back to school, from clothes to school supplies shopping, the running around seems like it will never end! Having two children in school means double the shopping, it can be overwhelming sometimes trying to get everything checked off your long list! If you have a child starting private school you will have a dress code, uniforms to be exact and even some public elementary schools around us are starting to require the children wear them. I've never even see uniforms in store so I can't even imagine having to run around and try to shop for them every school year. French Toast is America's leading brand of school uniform, they have been providing families with quality children's wear at great prices since 1958. They carry over 6,000 colors, styles and sizes for toddler size uniforms through young adult for boys and girls! Skip the lines and order online, you can even add your school's logo, then everything arrives nice and neat straight to your front door! 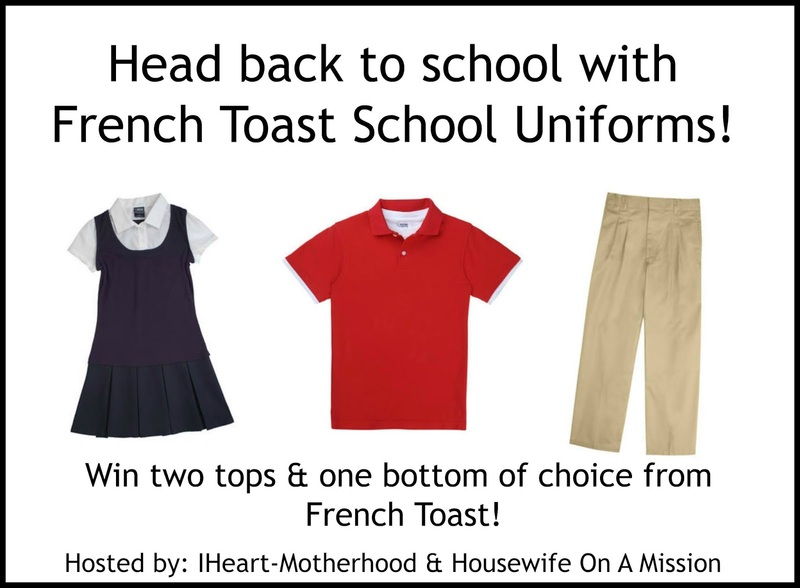 I was recently contacted by French Toast to review their school uniforms! 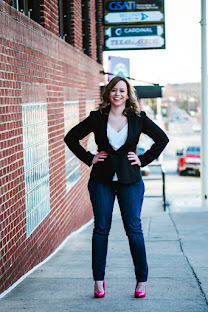 After browsing their website, I couldn't believe how cute, stylish and affordable their clothing was! I requested the Canvas Safari Shirtdress in navy and the Short Sleeve Interlock with Picot Collar polo in pink for my daughter. For my son, I was sent a Short Sleeve Pique Polo in teal and a pair of Pull-On Boys Pants in khaki. Little Sister C was really excited for her new clothing from French Toast! The Canvas Safari Shirtdress is hands down her absolute favorite, the fit is perfect, it features buttons all the way down and an easy self sash. I think the dress looks darling on her and she could easily layer it with cute leggings or tights in the winter for a fall look. The Picot Collar polo is amazingly soft, I love the feminine fit, it has cute flower buttons and the picot trim collar gives it a neat look. This polo could be worn with so many different bottoms from a classic look to a more dressed up style with a skirt. I love Big Brother C in polo's, it's my classic go-to look for him and French Toast doesn't disappoint with their fashionable and heavy weight pique polo. It features a drop tail hem and a three button placket (left over right), this top looks good tucked in or left out for a relaxed look. The easy pull-on pants feature a mock fly and button, two front pockets as well as a single back pocket. They are super soft but yet durable enough to wear everyday for play or school! I really loved this outfit on my son, the colors are beautiful and he just looks so handsome all dressed up! So what do you think about French Toast and their school uniforms? Connect: Be sure to follow French Toast on Facebook and Twitter! Buy it: You can purchase all of the items featured above online at French Toast! Win it: One lucky reader will win two tops and one bottom of their choice from French Toast! Very cute and what a great help it would be to get back to school to win! I so wish my kids' school did uniforms! I still have to start on the shopping. Will probably do it at the start of next week. Thanks. I've got some clothes and the backpacks. We haven't even started on school supplies yet!